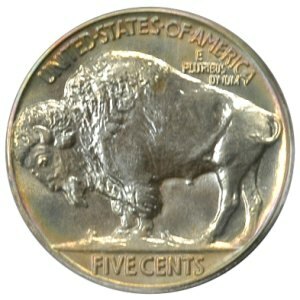 Description: This coin was purchased at the Bowers sales in 3/05, where it was described as follows:Warm reddish-orange peripheral toning forms halos around mostly lilac-blue centers. 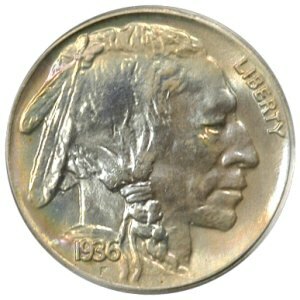 There is also a blush of the former color on the obverse below the Native American's eye, and some delicate lilac-pink and powder-blue undertones are also evident at the lower rim on that side (but only at direct light angles). Pleasingly full in strike, all features are silent on the subject of outwardly distracting blemishes. Virtually unsurpassable in grade at this certification service, this coin is a no-questions condition rarity that would fit comfortably into the finest Registry Set. Unbelievable toning.